​We only close on public holidays. 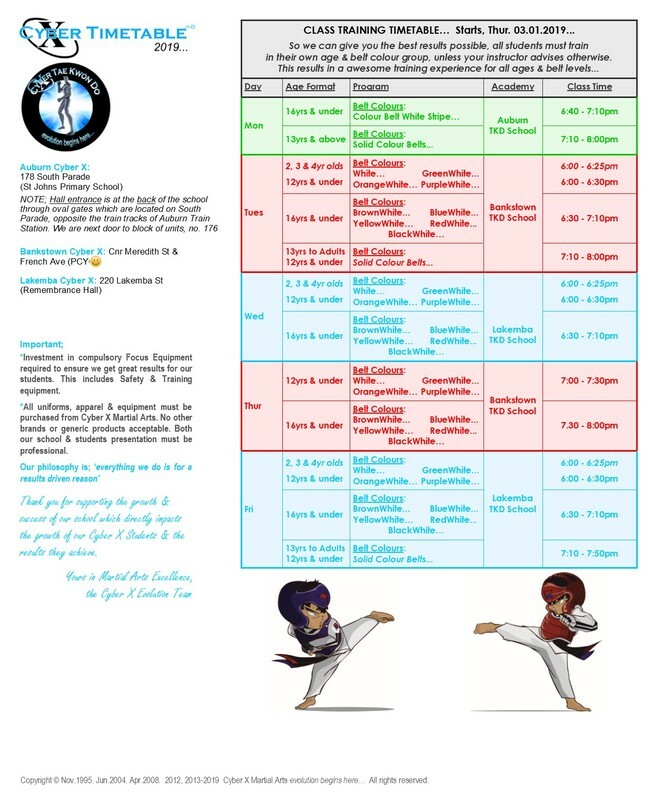 Also, once a year, we update our timetable to support the Muslims who fast during the month of Ramadan so that our Islamic students can continue training throughout the entire year, achieving their fitness results, because the key to becoming a Cyber X Black Belt is 'consistency over time'. NOTE 1: St John's Primary School is closed during the Summer School Holidays. But don't worry... even though we don't have access to our Auburn Cyber X Academy location, we are not going to cancel our training workouts. Instead, we will be temporarily training at 'Auburn Park', which is located on the corner of Hutchinson St & Goldsmith Lane. The park can also be found on the corner of Hutchinson St & Gibbons St. Same times, just temporary location. We will resume back in the hall on Mon. 11.02.2019. See you soon for some awesome outdoor training. NOTE 2: Please click our 'summer holidays...' link below, to see what days we are closed during the Christmas & New Years public holidays.